Au gratin is a French baked dish that has been adopted passionately by Japanese cuisine. Similar to its original French version, Japanese au gratin is baked or grilled until a golden brown crust is formed, usually from cheese or bread crumbs. The contents of the au gratin are creamy, rich, and white sauce based, often with various vegetables, proteins, or seafood. 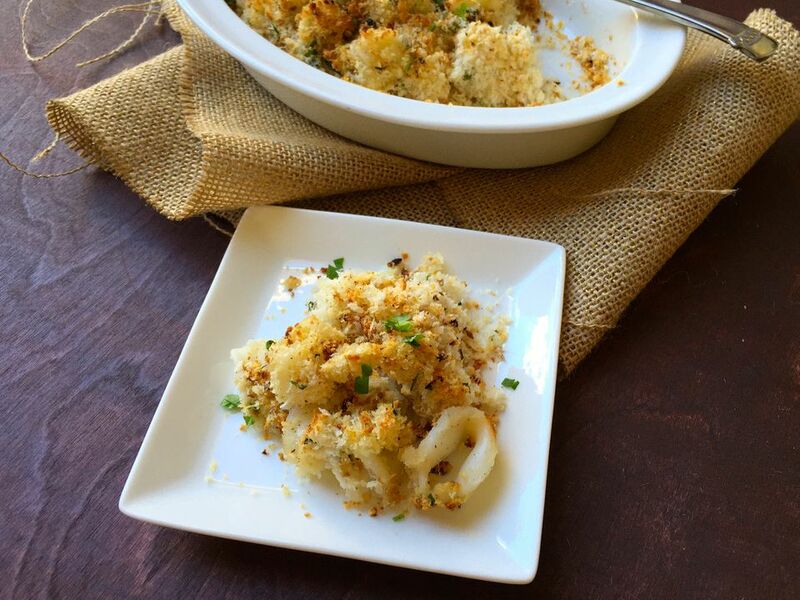 This garlic calamari version of Japanese au gratin differs from the typical creamy au gratin in that the squid is pre-cooked and then broiled with a generous portion of garlic-parmesan panko bread crumbs, and the cream is completely omitted. The result is a lighter, crunchier au gratin that is the perfect accompaniment to an ice tall glass of Japanese beer or sake. The addition of freshly chopped Italian parsley adds a refreshing flavor to the garlicky au gratin, and a drizzle of olive oil adds just a hint of richness. Slice fresh calamari into bite-size rings. In a small pan, heat a small amount of olive oil, add calamari rings, season with salt and pepper, and quickly saute until the calamari is cooked. Remove from heat, and set aside. In a medium bowl, combine panko bread crumbs, dry grated Parmesan cheese, minced garlic, and chopped parsley (reserve some of the parsley for garnish). Mix until the ingredients are incorporated. Season the panko mixture with salt and pepper. Coat small shallow baking dish canola oil or other cooking sprays to prevent sticking. Add cooked calamari rings to the baking dish. Spoon the garlic-panko mixture over the calamari, and coat generously. It will seem as though there is excess panko mixture, but, when baked, it will add delicious, crunchy, flavor to the dish. Season with a touch more salt and pepper, optional. Drizzle a generous portion of olive oil over the au gratin. For a richer flavor, cube a pat of butter, and sprinkle on top of the au gratin. In an oven or toaster oven, broil the au gratin until the au gratin has a golden brown crust, or until the desired color. Garnish with additional chopped parsley. Serve immediately. Optionally, add pieces of cubed unsalted butter on top of the breadcrumbs for a richer flavor. Bake the calamari au gratin in a larger family style baking dish, or bake them in smaller individual size ramekins.